IMAGE at right: The location of the Uniting Church and town council project as planned in 2014. Site ‘5’ of course is now the location of the towering Supreme Court. The town council is likely to become a substantial investor in the residential and commercial complex proposed for land owned by the council and the Uniting Church in the CBD. 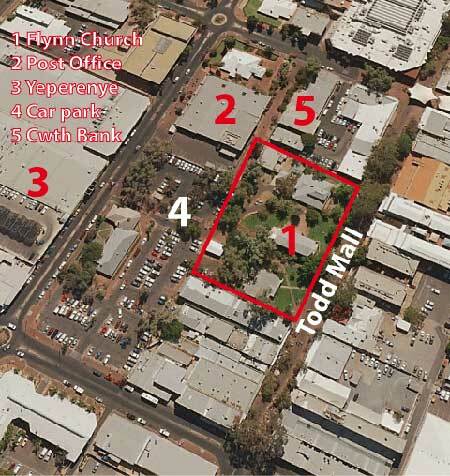 The complex, adjacent to the Flynn Church, would front Todd Mall and encompass the council’s Hartley Street carpark. Deputy Mayor Jamie de Brenni says in his view the council’s contribution to the project should be a multi-storey carpark, extending the number of parking places from about 235 by a further 100 or so. The council would receive an income from parking fees – a step in the right direction, he says, towards income-generating ventures with the aim to offset the council’s operating costs. Cr Steve Brown says he is enthusiastic about the proposal which had been talked about “forever and a day”. It has been put off for too long by a “conservative bureaucracy,” he says. Cr Brendan Heenan says investment of this kind should alleviate costs and would be preferable to “putting up rates all the time”. He says the Darwin council has commercial investments worth $20m, including carparks. 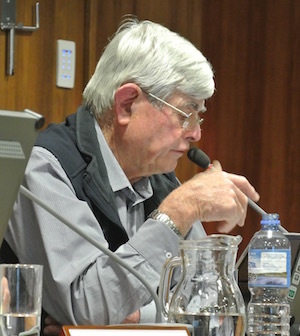 Cr Eli Melky is a strong advocate for commercial investment by the council while Mayor Damien Ryan says the council’s options are limited by the Local Government Act. The Alice Springs News Online has also invited Councillors Jade Kudrenko, Jacinta Price and Dave Douglas to comment. But Councillors de Brenni and Brown say the proposed National Indigenous Cultural Centre is not something the council should be financing. Cr Brown says the NT Government is “playing games” with the centre, while Indigenous figures are at loggerheads over the site for it, variously favouring Blatherskite Park, the Arunga Park speedway arena, the Desert Knowledge precinct and the Melanka block. The native title organisation Lhere Artepe “can’t even make a comment. Nothing is clear,” says Cr Brown. Cr de Brenni says the project firmly needs to be in the hands of the NT and Federal governments – it’s just too hard for the council to sort out the cultural, tribal and clan-related complexities. He suggests Arunga Park to be the ideal location, because of its appealing natural surrounding, and proximity to the Telegraph Station, forming a cultural precinct. 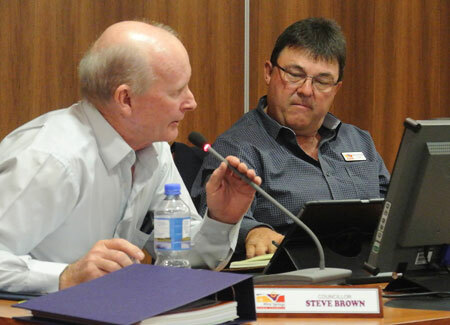 Speedway should be moved to the drags and Finke Desert Race facilities on the South Stuart Highway, creating an extensive motor sport centre there. Cr de Brenni (at right in the photo, with Cr Brown) says the Uniting Church project would need to take account of the many vacant shops currently in The Mall, which suggests a staged development. The ground floor could first be used for car parking, but allowing conversion to shops later on. Equally the multi-story car park should have provision for future extensions, as demand requires. He says the current short-term car parking is of little use for locals as well as tourists who want to be able to enjoy the town’s amenities without having to constantly move their vehicle. The council’s share in the Uniting Church complex would become a “community asset, paying for itself, an equity that grows in value which then can be used for other developments,” says Cr de Brenni. Eli You say that if the Polynesians can put on a cultural show, why cant we? Well the cultural centre is far less ambitious that the spectacular Polynesian show. Are you and the other members of council moving ahead with it? Absolutely not from what I can see. So why are you promoting an ambitious cultural show when, along with our other representatives, you can’t facilitate a cultural centre? Stumbling with the baby steps while talking about running a marathon? Running with an ambitious development while basic services are poor and very expensive? Drifting away from the boring core functions of a council to run a political agenda? @ Eli: That’s encouraging to hear you say, in a considered way, what many of the public think regarding the “establishment”. There are many in positions of power who, in my opinion, have been there too long. By being there too long they can bring up any number of reasons why things can’t be done with little chance of cross examination, except at the ballot box every few years by which time it is too late. Not that I am advocating this, but if Adelaide House was a 24 hour police station there would be a drop in crime / vandalism etc in the mall precinct. Just using that building as an example. Where are all these extra police we get promised just before every election? How is the Aboriginal liason officer employed by the town council going in helping the situation in the mall? And Eli, this might be a good time before the election to write a letter to the editor and detail what you would do to restore the law and order and what you would do to shake up the establishment for the better. Show us you have a detailed plan, or at least a map of how and why you would do it. Not just feel good phrases about “stakeholders / going forward / social reinvestment” etc, a real response. Then, the public might have more confidence that someone at least has an idea rather than keep the status quo and tread water. I think, Eli, that many of us are sceptical about the end result claims of benefit that are dished out by council and governments as a whole. Example: The redevelopment of the northern end of Todd Mall was going to revitalise that area. You could argue that nothing really seems to have changed for the traders up there. And being realistic, the crime at night in the CBD is going on without any tangible, visible means of controlling it. Once the shops shut and the roller shutters are down, the streets get handed over to the undesirables for the night. Hardworking business owners open up the next day to see if they survived the night. There is no way on this earth I would want to buy an apartment that’s located amongst all this going on. So, work with the police and various agencies to fix this mess up before you start building. Better still, don’t get the council involved at all, leave it to private enterprise and market forces. @ Russell Bray: The cultural centre should be out at the Telegraph Station. Move the speedway to the drag area for motor heads to enjoy, and use the Telegraph Station as our history centre, as a representation of two cultures joining. The local reaction to the development you have supported clearly demonstrates that. Similarly your idea of a Polynesian cultural centre as in Hawaii is not going to happen here and frankly is absurd in our context. One could write a book on the reasons for that. So we need practical development that is based on our town and we need representatives with a firm and complete grasp of the local realities and sentiments. Eli you say that creating open space is good, but query how I would justify paying millions for buildings from private land owners to create this open space. If open space is good why have you been supporting a development that destroys the best open space in the mall? The most positive experience of Aboriginal people and culture many tourists get is through the painting sales on the Mall open space. For many that is the sum total of their experience of another culture they have come half way around the world to meet. I see positive interaction on the open space all the time. Open space on the Mall is overdue to be revalued as a cultural meeting place for local Aboriginal people and tourists. It is a tourist drawcard. That’s how I would justify paying millions from the $30m the Council has to create more open space. @ Alex Nelson (Posted Jan 19, 2017 at 8:58am): Alex I am aware of the ability to claim a loss against gains that may have been generated from other areas, in this case an absentee owner can claim the losses such as depreciation, I assume. A qualified accountant would be best to answer this question. Even so I don’t know how it is of any benefit regardless of any tax loop hole to any absentee or local owner to leave a place empty. Firstly the value of their asset would be affected negatively, this may have an ongoing negative effect that disrupts their ability to borrow and grow their total business, and dare I say or even sell at a reasonable price. I am currently dealing with an absentee owner and this has not been my experience. The owners of my new office site have been extremely motivated to secure my lease. I was able to negotiate a much lower rent than the original asking price which allowed me to take a long lease. The current commercial market forces, Alex, are very vibrant and competitive if you look at the Yeperenye Shopping Centre and the Plaza. Both managements are doing everything they can to introduce new business and in some cases encourage relocation to their centre with many good incentives. This is very positive; sadly the Mall has had long term owners who may have paid off their buildings, so now they wait for the premium dollar thinking the Mall is prime retail shopping area. Well the owners have to get on with the job of working together and promote the precinct. This is why I pushed to successfully on council to establish the Todd Mall Traders Association. In the school of hard knocks that I grew up in, I learnt that sitting back and waiting for customers is not going to work. You have to make your own luck. @ Eli Melky (Posted January 19, 2017 at 7:36 am): Eli Melky’s argument that building more commercial real estate to add to the glut of existing vacant premises will improve a prospective tenant’s “ability and leverage to negotiate a cheaper rent” might apply if normal market forces were in play. However, I was informed some time ago that absentee landlords of vacant commercial premises in town are able to offset their losses in Alice Springs against income generated by properties they own in capital cities for taxation purposes. Consequently there is no incentive to reduce rents in Alice Springs, and (for example) this is reflected in extraordinary rents charged for empty premises in Todd Mall which deters prospective businesses from opening new shops there. Is this actually the case; and if so, what should be done about it? I’m also informed that in other countries (such as New Zealand, I was told) owners of commercial properties that remain vacant for an extended period of time are penalized, and this naturally creates an incentive to reduce rental costs in order to attract business tenants. On the contrary KC, it is not in our best interest to stay away from developing the town. A do nothing approach and the people most likely to benefit from lack of commercial property development or any kind of progress in this area will be the existing land owners who have charged a premium dollar for their space for too long. Also, if you add three more making it six vacant properties, that means to me that a potential tenant now has six options and has improved their ability and leverage to negotiate a cheaper rent. By the way, don’t underestimate the customer pulling power of a successful shop which will inadvertently bring about a benefit of foot traffic, positively effecting neighbouring shops subsequently improving the potential of leasing the remaining vacant five shops. Ummm, well it’s just that if there are three vacant shops and three more are built you end up with six vacant shops. That tends to make commercial real estate of this nature a tad less valuable, both capital-wise and rent-wise. Given that vacant shops in Alice Springs are spreading like cane toads in Darwin, I think that staying away from such a project might be in the interest of everyone. @ Eli Melky: I would like to say for myself, thank you for your comments, to me a common sense reply, not full of the usual political type answer we see a lot of the time. Also, it’s good to know someone on the council is reading residents’ concerns, and has taken the time to reply here. I would also like to add, that it’s all well for residents to voice concerns here and elsewhere, on this and other important issues, however we residents need to make the time to attend meetings and give some input in person. I look forward to attending council meetings. I like the idea for bikes @ Graham Tjilpi Buckley. @ Fred: Any proposal needs to have public support whether it is this or the next Council. Councillors should be able to at the very least stimulate the conversation with ideas, good bad or indifferent, it’s then over to the community to participate in the discussion. Your idea of creating open space is good, but how would you suggest we justify paying millions for buildings from private land owners just to create this open space. @ Russell Bray: I am in agreement with your comments, any proposal would need to preserve the heritage of this town and take advantage of the current ambiance from open space not destroy it. @ Dr Who: I can assure you that no one here wants to destroy the very soul of the town. Take a good look at us, we are all long term, some born and bred members of this community. Where would be the logic in destroying the town? @ Physics Bill and @ KC: You have me staggered at your conclusion that more vacant commercial property is problematic. How about we think of it as a positive, you see if there are more vacant properties available (supply), the balance will shift in favour of future tenants (demand). Additional benefits will be lower rents, more people employed, cheaper product, sustainable economy, more sponsors for local sport and charities. Gentlemen, competition is healthy. KC: Can you elaborate on your comment in relation to the punishment dished out by people with ruffled feathers last election. I appreciate your comments @ Tervor Shiell. You make a good contribution. @ Michael Dean: This elected member is reading your responses and the invitation to meet with me is always there. That goes to all of those who wish to discuss issues concerning this town. My details are available on the ASTC website. Please feel free to give me a call. There have been some good comments made here in response to this particular article, shame some feel the need to attach an unnecessary portion of venom as part of your comments. These councillors should take note of the ever increasing numbers of vacant shops. Adding more shops is adding to the problem and is in fact a clear disincentive to anyone owning commercial property in Alice Springs. It is risky enough now and new shops could double or triple the risk. Community opinion is strongly against this paid parking high rise. The punishment dished out by people with ruffled feathers last election might be revisited on those with short term memories next election. Last week, this newspaper reported on the abnormally high commercial vacancy rate in Alice. This week, I learn that the town council will build more commercial property. My suspicion is that the town council needs to help finance this because no other investor is willing to put their own money into building additional commercial property to add to the existing surplus. I hope some of the councillors are reading these comments and taking note of the mood of the people they are representing. I hope they also remember that an election is coming. Well said Fred: If this totally inappropriate rubbish keeps going ahead visitors may as well stay in places like the Gold Coast with all its concrete. As someone who has come back to live after a long absence I can’t believe that long term councillors who live here want to destroy the very soul of the town with this sort of thing, let alone even contemplate it. It saddens me to read some of the crazy proposals that are put up, this sort of thing is NOT the answer. Leave Flynn church and my old Hartley Street School alone. It has been there before all you people were born and has served its purpose in the past. Ruining a lovely place such as Flynn lawns where locals sit and enjoy. Should you want to go up one or two stories use the car parks already in existence in Hartlet Street and Stott Terrace. It would not matter to go two up for we already have a football oval shape ugly looking court house. The cultural centre could be built on the Melanka site and paid for by the Central Land Council through ABA where black fellow money is kept and of which we see nothing. Through Centrecorp which is part of the Yeperenye Shopping Centre. Build so all the black corporations can come together and be one. Surely you directors on these boards can organise something for us blackfellas. Should this happen just think of all our people owning our own art store instead of our people being ripped off like they are today. Just walk down the Mall. Just when I thought that episodes of Monty Python had well and truly been buried, up comes a proposal from some town councilors that would provide oxygen for that ridiculously funny show to re-incarnate. By mooting that a multi-storey car park, one that attracts fees too, is the sort of progress that Alice Springs needs beggars belief. With due respect to those councilors backing the wacky idea it is yesterday’s person thinking. Wikipedia tells us that the city of Copenhagen, flat like Alice, has had a very progressive cycle infrastructure program for many years. Since the mid 1990s, when they started their cycle monitoring program, there has been a steady rise in commute numbers.They claim that by 2010 rider commute numbers had risen to 50% for those 1.2 million people residing within the city boundaries. Declaration: I have a bias towards the bicycle but there is no pecuniary interest attached. I pride myself that through cycling I am promoting health and well-being as well as being environmentaly friendly. Alice Springs, with its flat terrain and short distances to travel to work for many, could easily become the cycling capital of Australia by shunning the car as much as is practical. Dare I say it dear councilors but climate change is a real happening event. This proposal is ghastly, inappropriate and destroys the best part of the Mall. It comes close on the heels of the monstrous law and order edifice, the new supreme court building. Spend the $30m to control rate increases and to unwind development to bring some of our town’s soul back. Perhaps acquire buildings near the mall to be demolished and turned into open space. The new proposal should be put on hold until the next council election. That way ratepayers will get a chance to vote according to the candidates’ disposition towards it. It is a worry that our council appears to be chronically incapable of coming up with development concepts that enhance the livability of our town. Mall green space gone – another reason not to visit Alice Springs. It seems a conflict of interest to have builders and developers on council deciding to spend our money on creating more work for themselves. And an ugly multistorey carpark is just what we need. The new court building may be well constructed. It is however, an ugly building, totally out of place in the town. Unfortunately the town is stuck with this edifice! The supreme court building is one of the few quality buildings in Alice Springs that will not need to be demolished in 30 years’ time, as what happens to most commercial buildings. Complete insanity, as others have rightfully pointed out. Paying for parking in the CBD is as mad as paying for parking at the airport (you know, the parking that was only supposed to be paid for two years to pay for the carpark – yet they kept it on and have even upgraded the system with a new one that still breaks). Messing with the church and lawns is criminal. Why not work on other areas of the mall, or slightly further afield at Melanka … build, don’t destroy. It seems hard to believe that this is being proposed in the centre of town. I have lived in Third World countries which have better planning and better vision for their cities than in Alice. It is a problem that we have a council made up of builders and developers who have no imagination. Like the four lanes through the Gap this is completely out of place, and context. Can you imagine the fuss if such a proposal was put up at for example Harndorf where their cultural identity and tourism industry was overpowered by a car parking facility next to a high rise ugly courthouse such as what has happened here? Their cultural identity has produced millions of tourist dollars while ours is languishing. What should be happening now is to replicate the commercial centre further south around Brewer and leave the current CBD to promote the tourism aspect, which is what people who come here are expecting to see. I would like to see the figures on how many people and vehicles pass daily through the Gap to employment in the area South of town and ask why they do not have the facilities to live closer to their employment. This was one of the concepts put up by the consultants to Kilgariff, namely that development should follow the railway, but was conveniently ignored. Kilgariff should have been further south, and the basis of a complete new commercial entity based around Brewer and the airport – just as what happened at Toowoomba, which has seized huge commercial advantage from its airport with direct access by air to China. We are just slow learners and do not look at what is happening elsewhere. All the major transport hubs and facilities should be centred there, just as happens at Port Augusta and Broken Hill. Already mining companies had seen the advantage of storing plant at Bohning, and surely must have given a lead to the planners as to the need. The current CBD situation and the Gap constraints will be exacerbated by the development of an industrial estate behind the Cemetery, a silly short sighted idea, adding again to the urgent need to move further south to where the infrastructure and future industry will have to be, leaving the town to do its tourist thing just as both Harndorf and Ballarat have done. One only has to visit these areas to see just how far behind we are in cultural tourism, starting with the visitors centres at McLaren Vale and Georgetown (in Queensland). We seem to be ignoring this for what is again blatant self interest. This would be a bonanza for the local construction and development industries here and also solve the problem of industrialization of the RL zone lands, which no one wants to tackle. It would also have left he whole strip between the airport and Gap as vivid exposition of what we can do here to attract investment. Last year I counted 104 tourists who stopped at the welcome rock in a single morning! Planners have blinkers just as many of the current council members appear to have. All of these things, had they been looked at from a broader perspective, would have made the current proposal and the Gap modifications largely superfluous. A similar structure South of Adelaide is signposted at $140 million. How does that compare with ours? They can’t be serious. The most appealing part of the Mall to be replaced by a multi-story car park and more shops? There are already many empty shops in Alice, and no-one is going to be happy about paying to park. The supreme court building is an eyesore, and looks like it is standing over the poor little volunteer-run youth centre crouching at its base. So much of Alice’s history and attractiveness has disappeared under ugly developments – meanwhile, there is little in the way of public or affordable housing available in the town. The Kilgariff development is still mostly empty and has no amenities. Get real Council, look at what is actually needed in this town to improve the residents and visitors experience of being here! Well said Michael. The town does Not need the feel of other cities or even Darwin. Just because Darwin is doing something does not make it a right fit for Alice. I am for development and progress if there is a clear benefit for all, not just monetary. Personally I feel this will detract from the “feel” of Alice and just be something you can see anywhere else in Australia (shops, apartments, multi-story car parks). Why do we want to try and be like other towns? And if there is the supposed $30 million in cash reserves stashed away by the town council, there must be other ways of generating income streams if they are so hell bent on doing it. But just remember, that money (if correct about the amount) doesn’t belong to the council, it belongs to the people who paid it. And they have a right to see it spent on the upkeep of the town.